Last month the Anodos team worked on an interesting investment governance project that we thought you might find elucidating. Facts: A grantor setup a “Net Income” trust in 1987 for the benefit of their grandchild. The historic distribution rate from this trust, after all administrative expenses, has been 3.2%. (We know this by reviewing the last 30 years’ worth of tax returns.) Since the 2008 housing crisis, the Net Income from the trust has averaged 2.1% due to the dramatic reduction in interest rates. The grandchild beneficiary is disabled and unable to work, and the fairly sizable reduction in income produced by the trust has been a hardship on the beneficiary. The trust document is clear that ONLY net income is to be distributed to the beneficiary, and it gives the trustee NO discretion to invade the principal of the trust. The trustee and Anodos identified three solutions that could be pursued to increase the distribution rate to the beneficiary. Solution #1: The trustee could invest a large portion (all) of the portfolio in high yield bonds or master limited partnerships which currently produce over 5.0% income. Though this would accomplish the beneficiary’s desire to increase the net income of the trust, both Anodos and the trustee felt doing so would violate the trustee’s duties to prudently manage the trust and diversify the trust assets from excessive risk in any particular security or sector. Solution #2: The Principal and Income Act allows a trustee to “make an adjustment between principal and income to the extent the trustee considers necessary…” To exercise this authority to adjust between principal and income, a series of 11 tests and conditions must be fulfilled or satisfied. One of the benefits of this approach is that if the trustee follows the notice requirements in the Principal and Income Act, they do not need to receive a court order to make this change. In this case the trustee decided to not use their “power to adjust between income and principal”. They felt that this would open up pandora’s box by suggesting to the beneficiary that at any time the trustee could waive their magic wand and transmute principal to income and increase the trust’s distribution rate. 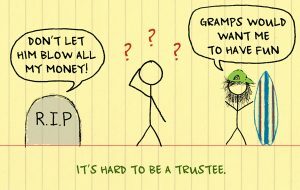 Solution #3: The solution the trustee finally adopted was to exercise their power to convert the trust from a Net Income Trust to a UniTrust. The statute says, “The trustee may convert a trust into a UniTrust… without court order, if all of the following apply.” Again, there is a long checklist of tests and considerations that must be addressed before this fairly significant administrative shift is made. In this case, Anodos helped the trustee and their local counsel conduct the analysis which concluded this trust could be converted into a UniTrust using the safe harbor payout rate of 4% using average year-end balances of the prior three years. Conclusion: This case study serves to illustrate that the statutes and the courts give trustees broad authority and discretion to meet the needs of the current beneficiary even to the extent of reallocating principal to income or administering the trust as a UniTrust though it was drafted as a Net Income Trust. In all cases where the trustee exercises this authority they are to act prudently, reasonably, and seek to balance the interests of the current and remainder beneficiaries. Following is a link to the test for the trustee to “qualify” for adjusting the trust from a Net Income Trust to a UniTrust.